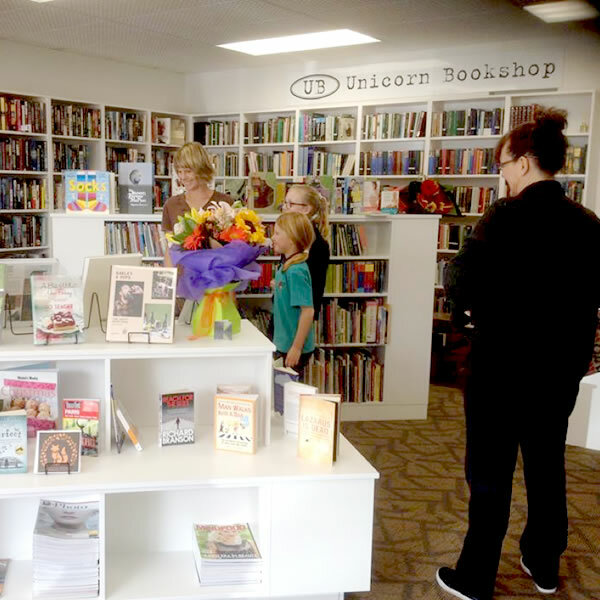 Unicorn Bookshop was established in 1989. 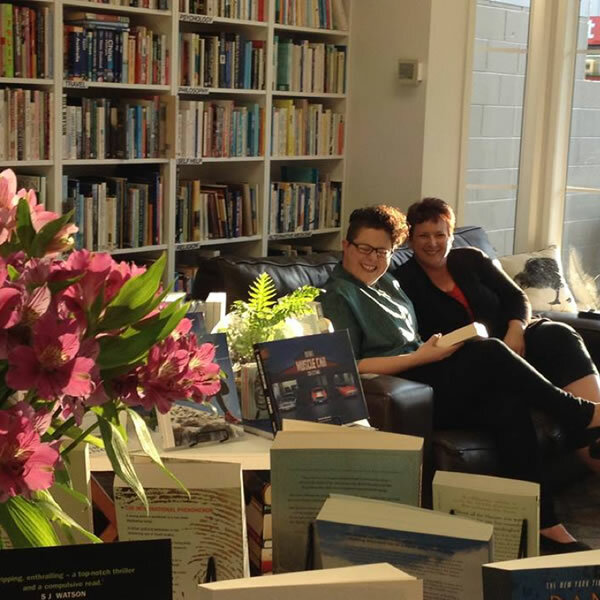 We are an online bookstore operated from Warkworth, New Zealand that serves customers throughout New Zealand and internationally. We specialise in quality used books including many rare, collectable and out of print titles, including technical and reference orientated books. 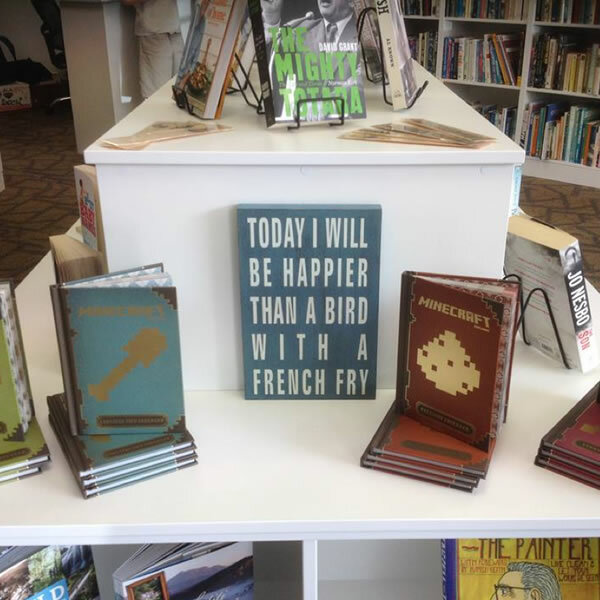 We also sell some selected new books. Because we are online our store is always open and we accept any currency. 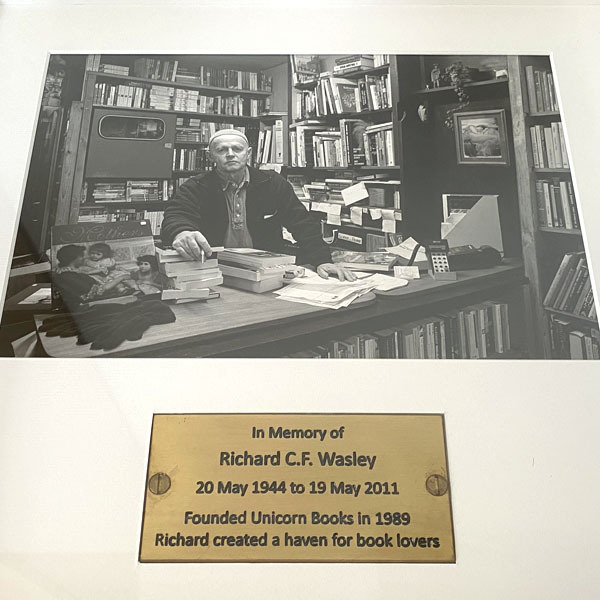 Unicorn Bookshop was established in a small stand alone shop Alnwick Street, Warkworth by the late Richard C.F. Wasley. 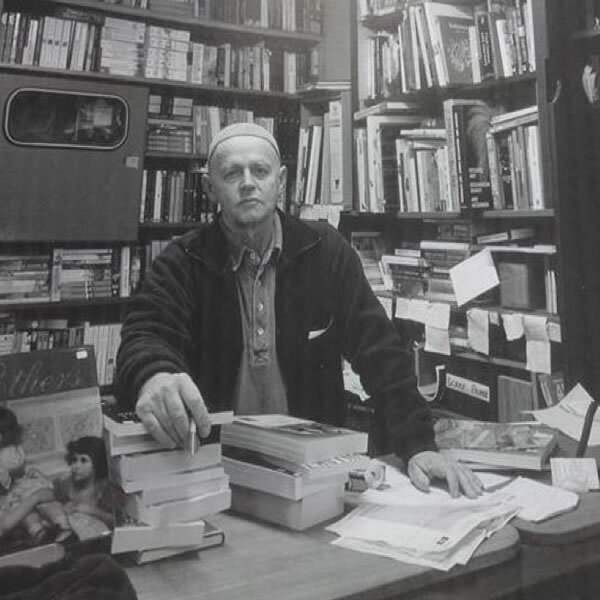 Richard later relocated the shop around the corner to Neville Street where he was a well-known part of the local Warkworth retail community until his passing in 2011, when the shop remained closed for a time until a new owner was found. Whilst still located in Neville Street the business was purchased in September 2014 from the subsequent owners by Justin and Karen Sollitt who refurbished and relaunched the shop in October 2014, as well as establishing the business in ecommerce trading. After a long and institutional association with the Warkworth retail scene, the business had to make a tough call in meeting the ever increasing demands of 'bricks and mortar' retail leasing in favour of ecommerce trading. 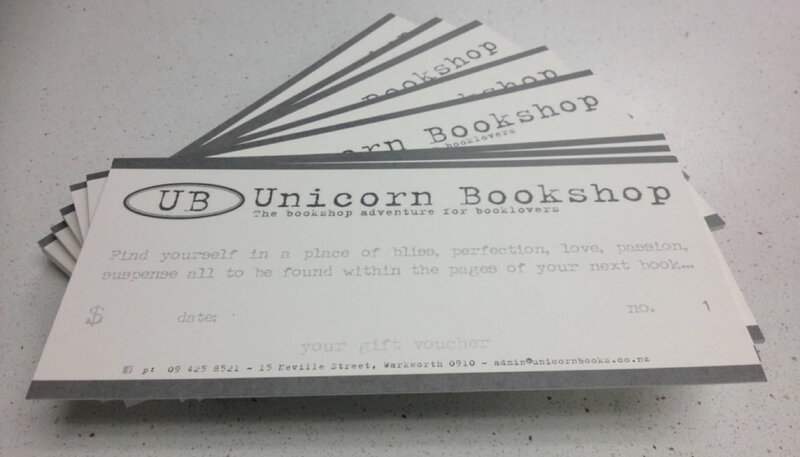 In late 2016 Unicorn Bookshop was relocated to its new and expanded online digital retail and social media spaces. With the shop installed into its new purpose built ecommerce platform it quickly started attracting customers from around New Zealand and internationally including Australia, Southern Africa, Europe and North America. Whilst some people still have reservations about buying online sight unseen, we have made a considerable investment in our ecommerce platform to ensure that browsing our books online is very nearly as good as looking at them off the shelf - and our ecommerce customer feedback stream via every listing speaks for itself. 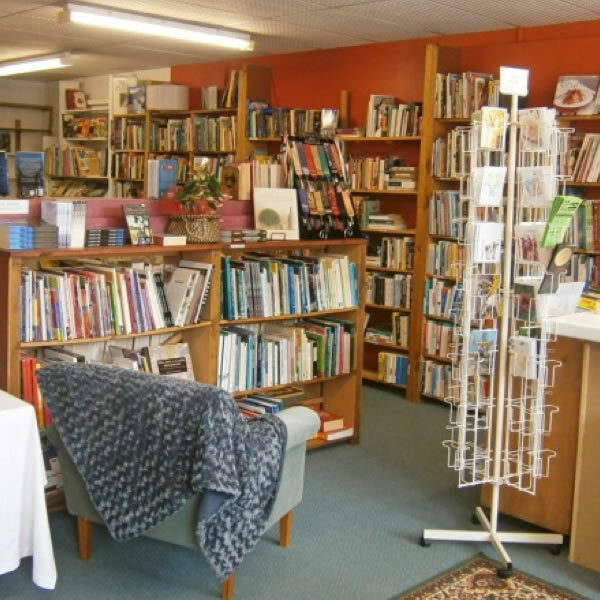 Unicorn Bookshop has built and maintains its reputation internationally for consistently supplying high quality books including antiquarian, rare and collectable, local history, vintage technical, reference and out of print general non-fiction. We also sell collectable items including old maps, photo books and newspapers. 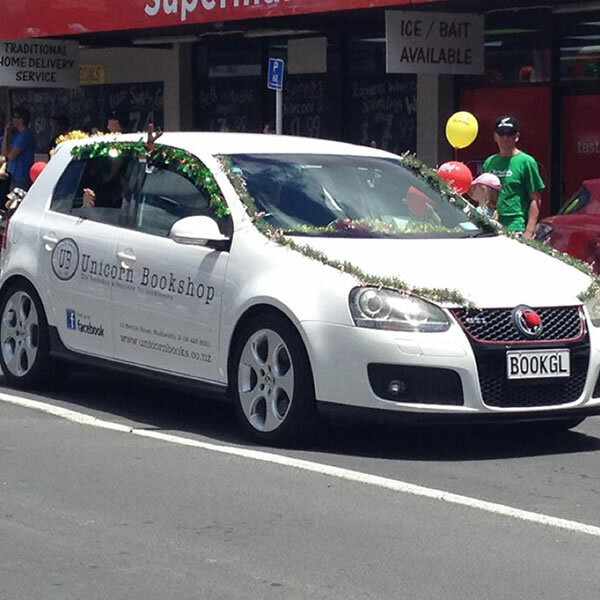 Today Unicorn Bookshop sees thousands of online visitors every month and we ship books to as many customers worldwide as we do around New Zealand. On any product listing you can see the width and breadth of our customer spread around the world as well as our live customer feedback. # Quality of representation: Any book can be instantly viewed by anyone worldwide as though they just pulled the book off our shelf. No matter if a book is described as brand new, good, fair or even damaged - our customers can see exactly what they are getting - the only thing we haven't done is read the book to you. Unicorn Books owns all its stock - we are not brokers/agents - we have inspected every book listed - our descriptions/measurements are meticulous - our photos are comprehensive and all original, never generic. # Responsiveness: Fast and responsive is our reputation. We do not operate automated reply messages and our team personally answer all customer enquiries worldwide - normally within 60 minutes. 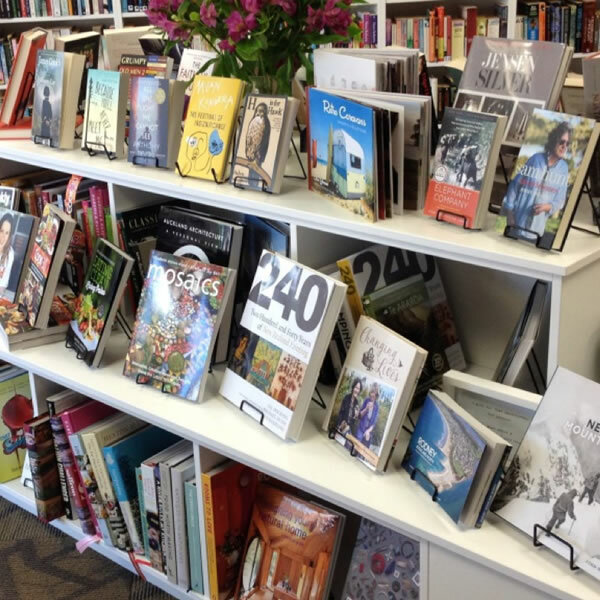 # Reliable sourcing: For customers seeking books not listed - Unicorn Books takes the risk out of procurement, especially internationally, as we are affiliated with many reputable book dealers worldwide. Whilst it is easy to find anything direct online - without industry connectivity it is also very easy to end up paying an unknown seller with little feedback in a faraway place for second hand book quality that is completely misrepresented, or worse, for a book that doesn't even exist. In our experience this risk applies when buying from even the biggest names in the business, as these operators often don't own and have never actually sighted the stock they are listing. Also seeking any recourse from large corporate re-sellers for poor quality is at best slow, cumbersome and expensive - even we have stopped sourcing from them. # Continuous high ranking feedback: Our live customer feedback can be viewed via any book listing. Maintaining a continuous quality feedback stream from satisfied customers worldwide is the absolute cornerstone of our business. # Free shipping: All prices quoted for New Zealand customers include free shipping, including rural delivery. # And of course photos of all the fabulous and famous people that have visited us. JUST 8 YEARS EARLIER - Owner Karen Sollitt was just a passing customer. Above is a photo of a book purchased from Unicorn Bookshop by Karen whilst on a holiday to Warkworth in 2006. (at the time she and Justin lived 1000km away at the other end of New Zealand). 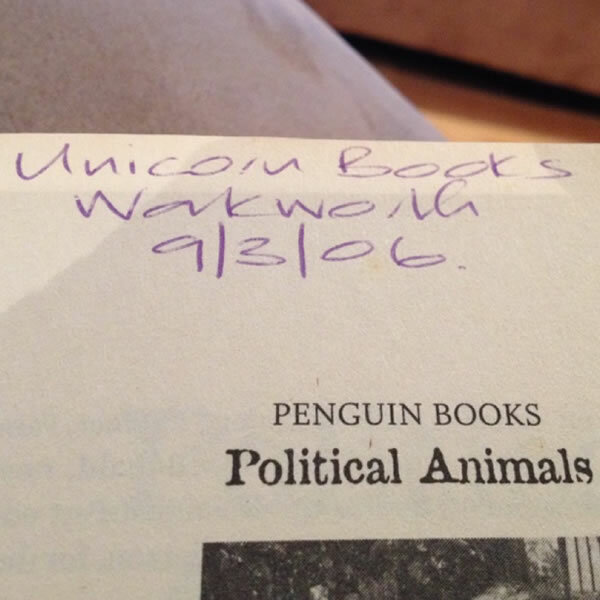 When Karen wrote this inscription inside her new book - it never occurred to her that in another 8 years - she would live in Warkworth and she would own Unicorn Bookshop. All prices are in New Zealand dollars NZD and include goods and services tax (GST). All prices include shipping to anywhere in New Zealand. Prices exclude shipping costs for all overseas customers, this is quoted/added separately at the checkout. Unicorn Books Ltd (UBL) offers all customers the option to pay for products via worldwide payment facilitator PayPal. 1. Receipt from PayPal confirming your purchase and credit card payment. 2. Despatch notification (including tracking information for shipments within NZ). The PayPal receipt for payment should be treated as confirmation that your order has been received by UBL. UBL cannot see any customer credit card details entered into PayPal, nor are they retained by either UBL or PayPal once a transaction is completed. It is the responsibility of the customer to ensure that their shipping address details are correct. Whilst the requirement for customers to provide their phone number is optional by law, we strongly recommend that customers provide their best contact number to ensure easy contact for the courier delivery if necessary. Shipping is all inclusive within the price, delivered anywhere in New Zealand. All shipments are routed within New Zealand via either Courier Post (NZ Post) or Fastway Couriers. Which courier we use is determined by the delivery address. All New Zealand shipments include track and trace service. Because international shipping costs vary considerably depending on the country, all international shipping costs are quoted and added separately at the checkout. To minimise cost all international shipments are quoted using standard international postal service rates. Please note that this service is untracked and UBL will not be held liable for any items that become lost in the post. Whilst actual occurrences of items becoming lost in the international postal system are rare, UBL will not be held liable for any tems lost where a fully tracked courier option was not originally requested. 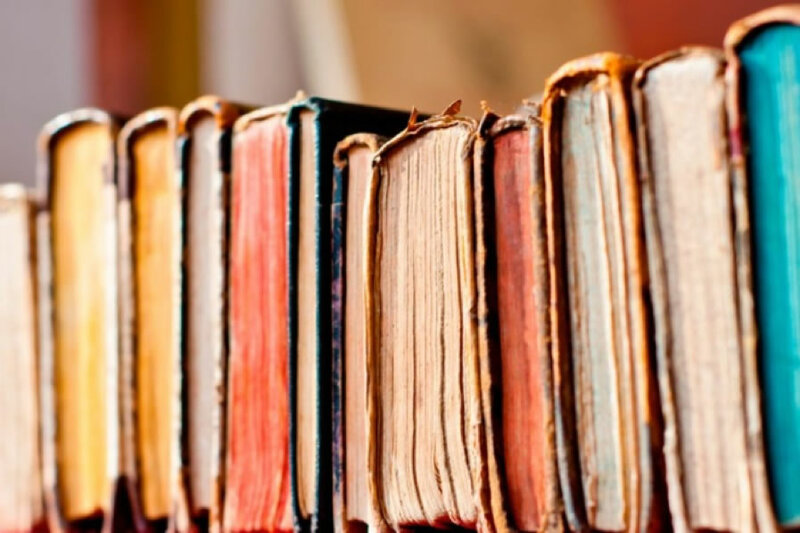 We understand that book descriptions on old and second hand books can be ambiguous and opinions on the condition can vary. If not already posted within the listing - we are happy to email a full range of images for any old or second hand books purchased on request. This is to ensure the quality meets your expectations prior to committing to despatch. As our customer feedback stream confirms - in the unlikely event that our listing descriptions are proven to be clearly inaccurate, we will refund your purchase in full. Damaged or loss to items in transit or once delivered. All books are quality checked prior to despatch. The risk of damage or loss passes to the customer at the point the courier leaves the shipment at the customers specified delivery address. All orders are loaded for despatch the same day as they are received. Orders received prior to 10:00 are normally despatched the same day, those received after 10:00 are despatched to following day. Exceptions are purchases confirmed on weekends or where demand is heavier than usual and despatch is delayed by a day. Whilst UBL requires that all freight companies that it uses expedites customer deliveries without undue delay and with proper care, they are independent providers to UBL and their service is ultimately beyond our control. So whilst UBL can provide customers a likely delivery lead time based on prior experience, the precise delivery date and time cannot be guaranteed. 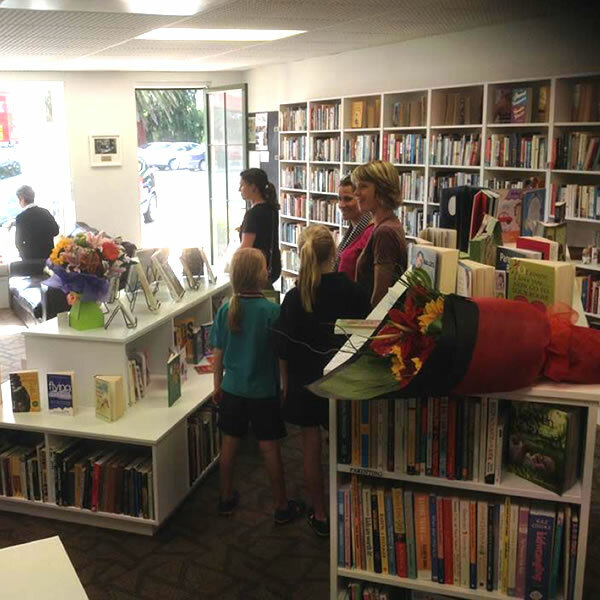 Unicorn Bookshop (UBL) will meet our obligations under New Zealand Consumer Law. UBL is not a second hand book exchange. Our team goes to considerable effort to ensure that all book sales descriptions (especially second hand and old books) are factual, accurate and correct. In the unlikely event that our sales representation is proven to be clearly inaccurate, UBL will accept the books for return and provide a full refund including paying the return freight. Any requests for return must be made immediately in writing (email), within 24 hours of the item being confirmed as delivered, including despatching the book back to UBL. All refunds on returned product sold to customers in New Zealand must be processed and paid direct into a New Zealand bank account. We do not process any refunds back through PayPal to your credit card (except for international refunds). UBL operates as a reseller/online retailer of books and related material. UBL will uphold its responsibilities as required by New Zealand Consumer Law. These terms are governed in accordance with the laws of Auckland, New Zealand. All parties relying on these Terms and Conditions agree to submit to the laws of this jurisdiction. Where any provision of these terms is deemed either void, unlawful or unenforceable, that provision may be severed from these provisions without effecting the standing of the remaining provisions. This website may contain links to other websites. Any link is only for the purpose of supplementary product information on the basis of best endeavours to help the customer. UBL gives no warranty as to the accuracy or currency of such information provided by any third party. All product information on this website is current at the time of publication, but remains subject to change without notice prior to sale. UBL makes every effort to ensure that all information published is accurate, factual correct and complete. All visitors to this site must assume that any reliance of this information is at their own risk. Refer also 4. Items appearing for sale on this website are all available ex-stock, shipped from New Zealand. UBL retains the right to either add, change or discontinue any stock item on this website, at any time, without notice. All pricing published by UBL includes Goods and Services Tax (GST) payable in New Zealand. UBL retains the right to adjust any prices on this website, at any time, without notice. Please refer to these Terms and Conditions outlined separately within the Shipping section. UBL operates internationally as a reseller of books and book related material, but does not purport to hold any proprietary rights to any publications or content that it sells. Unless required by New Zealand law UBL will not be held liable to the website viewer or any third party for any damage caused directly or indirectly as a result of the use of this website. You agree to indemnify and keep indemnified UBL from any liability or damages incurred as a result of your use of this website. Please refer to our these terms and conditions outlined separately within the Online Payment Security section. Please refer to these Terms and Conditions outlined separately within the Returns section. 14. This UBL website is secured with a SHA-2 256bit SSL encrypted connection meaning that any information you share or view through the website is completely secure. When viewing https://www.unicornbooks.co.nz/ you should see a padlock symbol + "secure" in the top left of your browser address bar - this confirms our UBL independent certification for website security and compliance with international online protocols. 15. UBL remains committed to the privacy of everyone who does business with us. Any information collected from customers will be treated by UBL as private and confidential. All information will be managed with the at least the same degree of security and care that UBL manages its own commercial information and would expect anyone else to manage our own information. 16. This information is collected in both hard and electronic format via the normal course of our business, including: general correspondence and requests for information, trading and transaction records, delivery/freight forwarding records and website analytics. 17. Whilst UBL retains information in the interests of sound record keeping (excludes credit card details), unless required by law or as requested by the person or entity that the information directly relates to, UBL will never otherwise disclose, share or sell any information, personal or otherwise. 18. Whilst UBL may add its customer details to a direct mail database, the customer will always be given a simple ‘opt out’ or 'unsubscribe' option to enable them to be quickly removed from such a list.